Description: This ad features the pictured A. Peterman of 151 Walnut St. Philadelphia 4 Gauge Hammer Shotgun with Damascus Barrel. 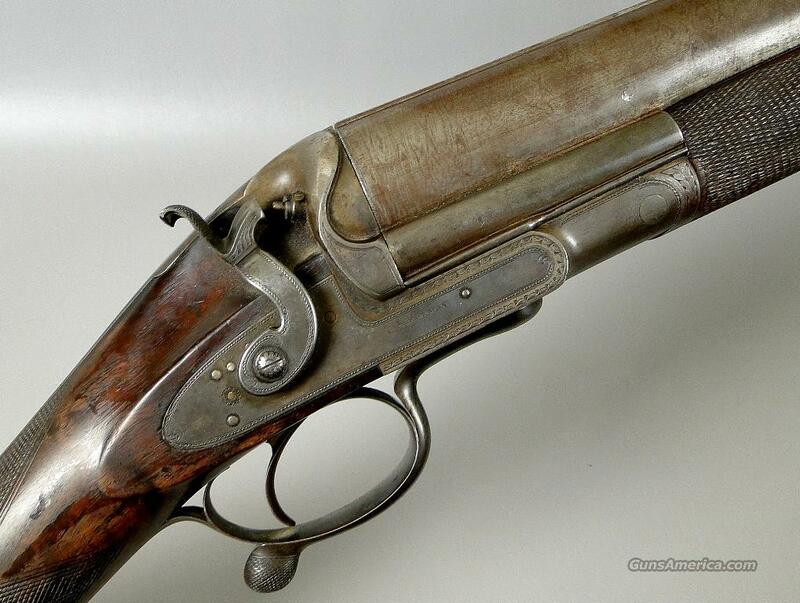 This is an outstanding example of a US built 4 Gauge Shotgun. There are no foreign proof marks on either the receiver or the barrel. The gun appears to have the original case coloring and brown finish on the barrels. The wood has had a coat of oil added at some point in time. I do not think it was sanded as the wood to metal fit is perfect. The barrel is 39.5 inches in length and the length of pull measures 13 and 3/8. The gun is in good working order and locks up tight. There is a small gap at the breech. Also included are the pictured loading tools. Please take a close look at the pictures to see all the details. Please feel free to call us at 410 820 8811 if you have any questions.